Forever is a long time but after three months using my new drawer organizer from OrganizeMyDrawer.com, I'm ready to say this solutions works! Why? Everything is still where it belongs in the drawer, which tells me this drawer organization is working. Even better, things are getting put back in the drawer. And when my husband asked me if I knew where the tape measure was, I said … in the kitchen (meaning my organized kitchen junk drawer). Here's the funniest thing that's happened with this drawer so far. There's a compartment for my tape measure and now there are two of them. The drawer is acting like a magnet for the stuff that belongs there. Want to learn a little more about this cool tool to help you organize your drawers? Designing your drawer is easy. Deciding what belongs in the drawer is harder. 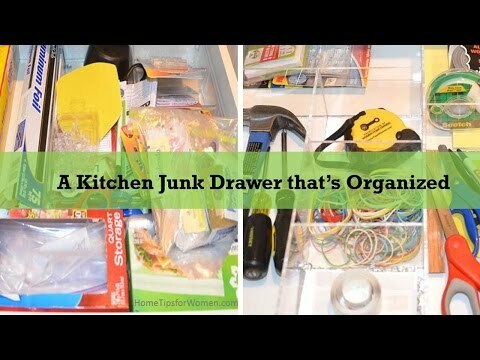 I fell in love with OrganizeMyDrawer's “solution at the International Home Builder Show. When they offered to give me a drawer in exchange for sharing my experience, I was thrilled. Once I figured out my drawer organization, the design was easy and my new acrylic drawer organizer arrived in just a few days. That's why I'm excited to share this opportunity with you. Good luck to everyone and you get to enter multiple times, earning one/multiple entries for each item listed in the Rafflecopter table below. If you have any problems, send me an email and I'll do my best to find a solution … so you can enjoy your home more. Getting more organized takes an investment of time. If you believe one of these organizers can save you just 5 minutes a week, that will add up to 4.5 hours a year. It might also save you money because you'll find things and won't rush out to buy a duplicate like my three irons. PS Most drawer organizers are less than $70 (includes shipping) and mine was too, measuring roughly 18 x 18 inches. On a Clear Day, Where are Your Counter Tops? Awesome giveaway! I am in desperate need of organization. Morgan, Sorry you didn’t win this time but keep watching for when we offer another one. I was here 🙂 Great post! I am still working on my craft room and always looking for better organization ideas. These drawer systems look great. Janine, Oh, I’d love if you’d share photos of your craft room & maybe we could write a story together? Oh, I need this! I have one weird drawer that I just can’t properly fit ANY organizer into! Good luck Lynda, and the drawing is totally random although this is my first time using Rafflecopter so still learning. Julie, That’s a great idea so I’ll pass that along to Andrea, my contact at OrganizeMyDrawer.com … and watch for news about another giveaway, you never know what’s in your future. You are an excellent resource for women homeowners! Thank you for all you do! Thanks Stefani, and I especially like your questions which are always challenging. Mickie, Which drawer would you organize? So do I Linda, and even better is when I finish an organizing project and it works like this one! Love this! What a great way to get organized. I can think of several places in my home where this would make my life a lot more organized. Thanks Tina.